Most of the standards revolve around anchor standard 1: Textual evidence. The prototype assessments developed by PARCC have an entire category of questions devoted to students providing textual evidence. PARCC asks the students a question about the text and follows up with a second question that asks the students to identify support for whatever they inferred for the original question. To do this students need explicit and consistent instruction in textual evidence. Textual evidence is the core of argument and analysis. 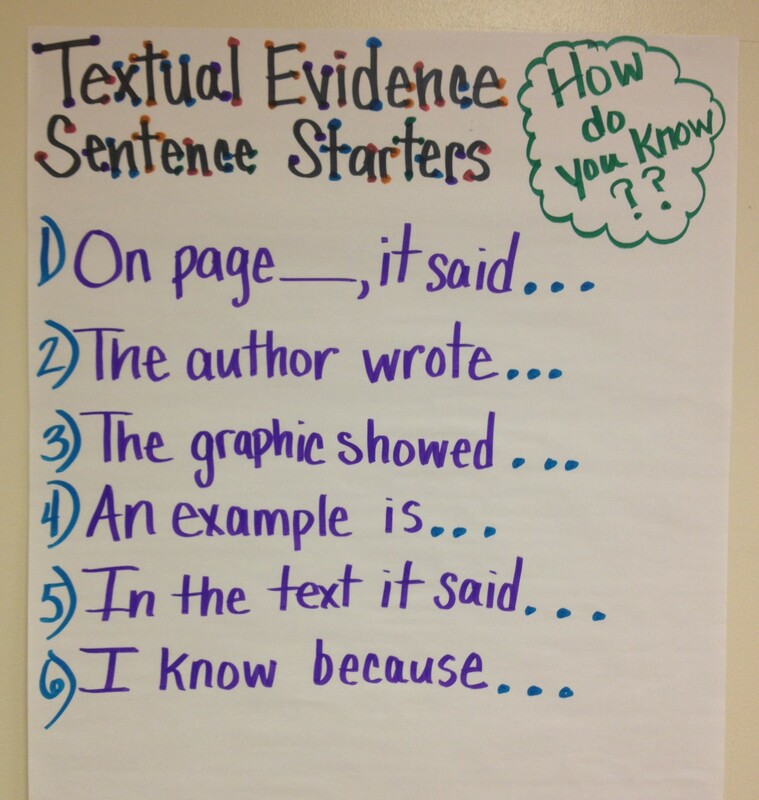 Textual evidence is support lifted directly from text to support inferences, claims, and assertions. Think critically about this. Textual evidence is a student supporting how they know something. There is a lot of buzz about text dependent questions and requiring students to refer to the text, but isn’t that what good readers do already? This is the opposite of giving a memory text, camouflaged as a reading test. You know the test where kids can’t use their book to complete a reading test. They have to prove that they have memorized the facts and details, then answer knowledge questions about what they read earlier. Textual evidence relies on the direct opposite theoretical perspective. Textual evidence does not want to keep the text a secret when students discuss or answer questions about their reading. Textual evidence demands that readers engage with the text and share what specific aspects of the text influences their thinking. Instead of asking what the central idea is, teachers may want to rely on the addition of three words: How do you know? How do you know what the central idea of the text is? What proof do you have? This is where textual evidence pushes students to. When you plan instruction this is the first standard that you need to explicitly teach. All of the other standards rely on students being able to actively use the ability to make inferences and find evidence in a text to support these inferences. There are two different types of things that anyone can say after reading a text. One is something that they noticed that was explicit. These are those things that are stated directly in the text. Andrew Carnegie gave large amounts of money to charity. If the text spells information out for the reader it is explicit and the textual evidence is the actual statement. The other types of things that we notice are implicit. We make meaning based on clues from the text. The Common Core standards call these types of things inferences. Students need evidence to support inferences. This type of textual evidence is not directly stated. Andrew Carnegie was hard working. This could be an example of an inference that a student might make after reading about his life. The text may never state explicitly that he was a hard worker, but specific lines of text might support this conclusion—called inferences. This is a combination of what more traditional standards might have called drawing conclusions. What Common Core has done is demand that students break that into chunks. What do you infer? How do you know? A great anchor chart that I use with this standard should be a staple in all K-8 Common Core classrooms. I am going to try this in my class on Monday. Simple–to the point. Dr. Roz!! I love your site. I have been using it to do what you described in one artcile as ‘planning explicit standard instruction’. My question is this: Do students always use this standard with EVERYTHING? I think that every one you get to is really still about this goal of finding evidence to make connections or infer. How do you think about that in terms of planning? Nice tool to help students connect with critical textual evidence! Perhaps #5 should read “The text says” instead? I would definitely have to correct a student who used redundant phrasing, and in our college courses we always use the present tense when citing (MLA style). It would be wonderful to train students with that habit. Keep up the great thinking! Thanks. You have a great site over here! I am a reading Specialist and I have my teachers studying your unpacking of Textual Evidence. This is the best break down that I have seen through the different posts. I gave them the assignment to search your sight for textual evidence and present out to the group. They had a great understanding and want you to do ALL of the standards! Is that too much too ask? Thanks for sharing this interesting stuff for us! I cannot thank you enough for this Common Core article. It helps to see the real connection to the reading class. I appreciate the information at the follow up on facebook!